Google added a new sorting option for Google Images that lets you sort the images by subject. So if you are looking for pictures on a topic but want to know subjects for those pictures, you can use Google Images. 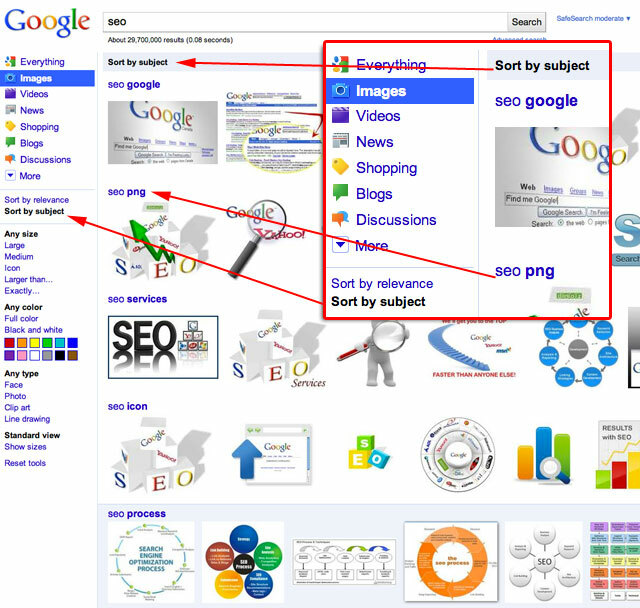 For example, if you want to create a presentation on SEO and want to know what subjects the presentation might have, you can try to search Google Images by subject sorting for [seo] and Google will recommend subject. They aren't perfect but hey! Sorting by subject uses algorithms that identify relationships among images found on the web and presents those images in visual groups, expanding on the technology developed for Google Similar Images and Google Image Swirl. By looking at multiple sources of similarities, such as pixel values and semantic relationships, and by mining massive amounts of data, we can make meaningful connections and groupings among images. For more sorting options, see google.com/landing/imagesorting/.